New complete ready to run HEI distributor. Features a 50,000-volt coil, which produces a 50,000-volt spark through 7,500 rpm. Distributor includes a high-performance timing curve, premium cap with brass terminals, low-saturation ignition module and die cast aluminium housing. Simple wiring makes this a good choice for performance street engines. 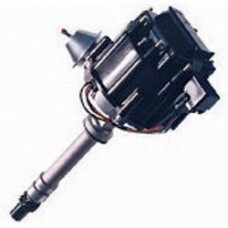 Distributor has vacuum advance, which can be plugged or changed for adjustable advance canister RUK66952C. Fits Small & Big Block Chevrolet.